When computers were being first invented, they were intended for what their name implies. Computing. Number crunching. Calculating. At its core, the Macintosh computer is yet another cluster of circuit boards and wires which is capable of processing billions of instructions per second. EdenMath is a scientific calculator which does standard arithmetic, probability, and trigonometric functions. 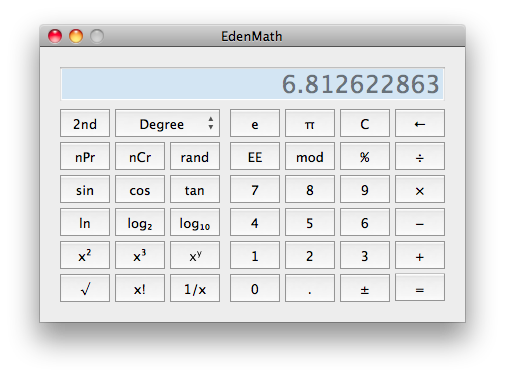 EdenMath 1.1.1 and later is protected under the GNU General Public License (GPL), which allows other users to change the distributed source code for their own use. An excellent example of this practice is Robert Burns' GNUstep version of EdenMath. As an educational and scientific tool, EdenMath is freeware, costing the user nothing.